Mountain Side has an alternative drop-off point for easy 24/7 gear pickup and return access. Please contact us for more information. There is not a backpacking rental package available anywhere else that offers what we do for the price. Each backpacking rental kit is loaded with award-winning gear that will deliver performance and comfort on any adventure you may have. Just as a shortcut in the backcountry can create a world of misery for you, we cut no corners with the gear in our backpacking package. Our backpacking kit rentals include everything but the food and the fuel and are predicated on the 10 Essentials (print our Backpackers Checklist for guidance). Mountain Side Gear Rental offers backpacking rental packages with One, Two and Three Person Tents, each with two doors and full rain-fly, super-lightweight air pad and a choice of sleeping bag temperature ratings, fully-adjustable backpacks in youth-sizes, female-specific and large capacities to choose from, cook-sets for solo or paired trekkers, 1st aid kit, bio-degradable soap, rope, headlamps and more. All rental gear is cleaned and sanitized after each rental, every time. This complete backpacking rental kit has everything you need for your adventure! Whether it is for a weekend trek or a 125 mile thru-hike, this kit has more award-winning gear than anywhere else. Only MSGR includes this much gear in one kit. Upgrades are available. Trail weight of 15.5lbs. Cold Weather package options are available. 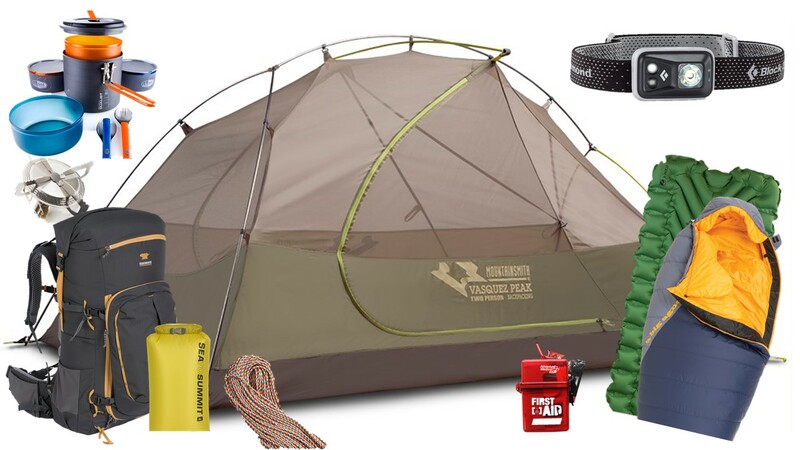 This complete backpacking rental kit has everything two people need for an amazing adventure! Whether it is for a weekend trek or a 125-mile thru-hike, this kit has more award-winning gear than anywhere else. Only MSGR includes this much gear in one kit. Upgrades are available. Trail weight per person is 14-15.5lbs, depending on how you divvy up the gear. Cold Weather options are available. This complete backpacking rental kit has everything thee people need for an amazing adventure! Whether it is for a weekend trek or a 125-mile thru-hike, this kit has more award-winning gear than anywhere else. Only MSGR includes this much gear in one kit. Upgrades are available. Trail weight per person is 12-15lbs, depending on how you divvy up the gear.